Mokuleia is what I refer to as the uncrowded half of the North Shore. Most tourists drive to Haleiwa and go North to find crowded beaches, food trucks, turtles, fruit stands, snorkeling hubs and all sorts of fun attractions. With the enormous winter swells, big wave surfing competitions and gorgeous sandy beaches, it’s very hard to resist. But if you have an extra day or even a few spare hours, I recommend taking that less-traveled road in the opposite direction toward Mokuleia. 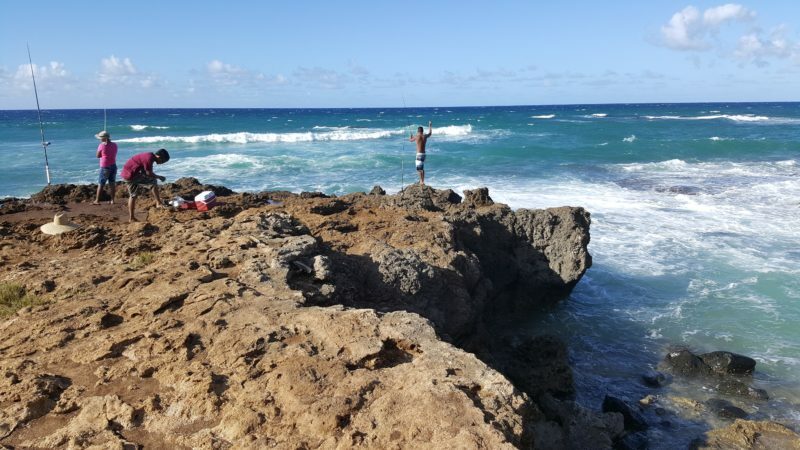 There are a few beaches including the Mokuleia beach park, wild waves, a handful of switchback hikes and much less people compared to Haleiwa. You’ll end up in one of my favorite spots on Oahu. Where the mountains really do meet the sea. 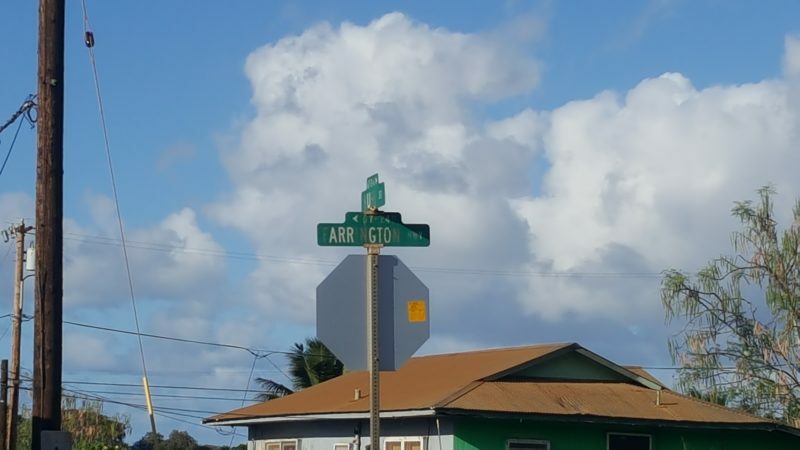 Follow the signs for Mokuleia and you’ll find yourself on Farrington Highway. With the Waianae mountain range on your left and the Pacific ocean on your right, there’s almost no way you can get lost and you’ll get to enjoy a lot less traffic, cars and people! Local Tip: This area is littered with great hikes that give you a terrific view of the North Shore. My favorite is the Kealia Trail – a fairly easy switchback hike that’s good for all ages. Just keep driving until you get to the Dillingham Airfield where there’s a large parking area and even clean bathroom facilities that’s available to hikers. The best part is that dogs are allowed on the Kealia trail! Right about here is the farthest your vehicle can go. 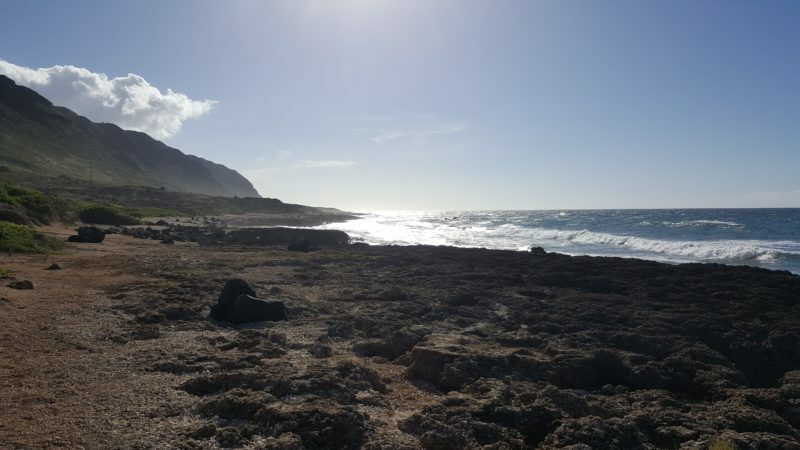 There is a small dirt lot designated for cars to the left of this photo, which is also the entrance for the Kaena Point Trail (which I recommend for monk seal and bird lovers). You’re free to walk all around this area and check out the tide pools, watch the surf and just soak up the moment and fresh air. The wind here is strong with that salty flavor and the view is spectacular. The ocean spray will cool your skin if you stand too close and you’ll even be able to see the faraway windmills that my camera couldn’t really capture in the background. Almost every time I’ve come here there has rarely been more than ten people wandering around. In fact, on this visit I was with my friend, another couple explored far away from us and one local family of three looked like they had passed the whole day away fishing off the rocks. Local Tip: The North Shore is filled with plenty of fun for all. While most people spend the day here visiting the beaches, many people opt for other activities such as sky diving or flying. There’s an air field here because the wind is so strong in this area! If you need a bit more convincing, check out this short video where I’m just turning around with the camera to capture the scenery all around me. Just listen to that wind!